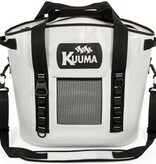 The Kuuma Soft-Sided Cooler is a lightweight option when you need to keep things chilled on the go. The closed cell foam insulation provides all day cold without all the bulk. 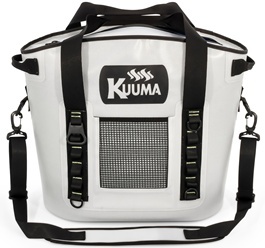 Sealing zipper prevents spills and allows for better loading & access to cooler contents. The Soft-Sided Cooler has three different carrying options: the handle grips on each side, the tote straps in the middle, and a long shoulder strap that is removable when you don’t want it. The rugged, waterproof shell is constructed of PU coated 840D nylon material. Each option is reinforced with double-stitching for strength and durability.